by Aaron R. Morrison, M.D. [EDITOR’S NOTE: One of the strengths of Apologetics Press for the past 28 years has been the way A.P. publications have reflected an accurate blending of science and Bible. Since the Creator produced both the Bible and the physical Universe, no contradiction between the two is possible. Yet much of the “science” being alleged today is pseudo-science rooted in evolutionary theory. And much of the “religion” being perpetrated today is pseudo-religion rooted in human theology. In reality, true science is in complete harmony with a correct interpretation of the teaching of the Bible. Through all these years, A.P. has maintained its longstanding tradition of providing the public with cutting edge analysis of the central scientific and religious issues of the day. In that spirit, we are expanding our science department by building a team of scientists who are academically credentialed in their respective fields of scientific expertise. They are well-qualified to address matters of science as they relate to the overall creation/evolution controversy. Articles by these auxiliary staff scientists will be appearing both in Reason & Revelation as well as on the A.P. Web site. Have you ever escaped the haste of society and taken refuge on an ocean beach, lakeshore, or riverbank, and listened to the calming sound of the waves as they collapsed upon the shore? Have you been amazed at the powerful crash of thunder overhead during a thunderstorm? Do you enjoy listening to the peaceful and varied songs of nature’s winged vocalists? Do you ever take solace hearing the comforting words of a loving friend or family member? The human hearing mechanism is tremendously complex and wonderfully designed. A brief look at the structure and function of the ear will, at a minimum, lead one to a greater appreciation for the complexity of the ear. More important, it should lead one to a greater appreciation for the One who is responsible for the intelligent design of the ear. For those who contend that organic evolution is responsible for the development of the human body (and nature in general), a closer look at this organ system ought to provoke reconsideration and an honest assessment of the impossibility of random events leading to such marvelous complexity. 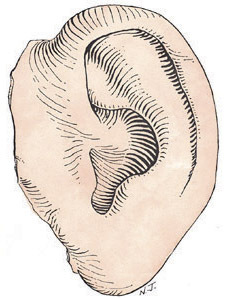 The ear is divided into three parts: the external, middle, and inner divisions. The structures of the inner ear are responsible not only for sound processing, but also balance. First, let us identify the structures contained within each division of the ear; then we will examine how a sound wave travels through each portion of the ear and eventually is perceived as sound. The pinna confers an acoustical advantage of approximately 2-5 decibels (dB) in humans (see Figure 1). The EAC serves not only to protect the middle ear but also enhances hearing by 5-10 dB at frequencies near 2000 Hertz (Hz) which are important frequencies for understanding human speech. The outer third of the EAC is surrounded by cartilage while the inner two-thirds are surrounded by bone. The middle ear is composed of the middle and inner layers of the TM, the ossicles, also known as the malleus (or hammer), incus (or anvil), and stapes (or stirrup), the smallest bones in the human body (see Figure 2), the two smallest muscles in the body, the stapedius and tensor tympani, and the opening to the Eustachian tube. Together, the middle ear structures function as a transformer of sound energy from the air (in the EAC) to the fluids of the inner ear (cochlea). As sound waves contact the TM and create movement of the eardrum, the ossicles (malleus, incus, and stapes) are set in motion. 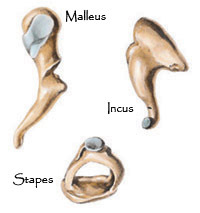 The malleus is connected to the TM, while the incus is connected to the malleus, and also to the stapes. The stapes, in turn, is in contact with the oval window of the cochlea (see Figure 3). The stapes is the smallest ossicle and, interestingly, is of adult size and form at birth (Lee, 2003, p. 13). 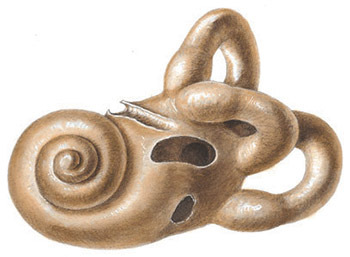 The stapes’ foot plate rests in the oval window of the cochlea and acts like a piston. Carefully note the beautiful design of this mechanism: as sound energy is collected over the relatively large surface area of the TM and concentrated on the small footplate of the stapes, the mechanical advantage results in an increased auditory sensitivity of approximately 24-25 decibels. An additional auditory advantage of 2-3 decibels is obtained by the lever action of the ossicles themselves, resulting in a total middle ear auditory advantage of approximately 27 decibels (Templer, et al., 1987, p. 21). Fig. 1,2,3 LifeArt image copyright 2007 Lippincott Williams & Wilkins. It is interesting to note that the two smallest muscles in the human body are located in the middle ear space. The smaller of these two muscles, the stapedius, is just over one millimeter in length. As its name suggests, it is attached to the stapes. What is the function of the smallest muscle in the body? When loud sounds are encountered (sounds louder than approximately 80 decibels), the stapedius contracts and holds the ossicular chain in a more rigid position in order to prevent excessive movement of the stapes (Calhoun, et al., 2001, p. 1624). This serves to buffer the intensity of sound wave transmission to the cochlea. If an individual develops paralysis of the stapedius, this buffering mechanism is lost and loud noises become deafening. The stapedius plays a very important role in preserving our hearing. The “hair cells” in the cochlea (discussed below) are highly sensitive and repeated exposure to loud noises over time destroys hair cell function and is irreversible. Hearing loss is the unfortunate consequence of hair cell destruction. This is why otolaryngologists encourage everyone to use hearing protection when they are working around loud machinery or taking part in recreational activities that result in significant noise exposure (e.g., gunfire). The second smallest muscle in the human body is the tensor tympani. Despite years of technical research and study, the role of this muscle is not fully understood. Among other functions, it has been credited with decreasing the amplitude of sound energy transmitted to the cochlea. However, acoustic reflex data has suggested that the tensor tympani does not normally respond to intense sounds (Calhoun, et al., 2001, p. 1624). The tensor tympani is connected to the malleus, the ossicle which itself is connected to the tympanic membrane. When the tensor tympani muscle contracts, it pulls on the malleus and tenses, or tightens, the tympanic membrane (hence the name, tensor tympani). This appears to dampen the vibrations of the eardrum and may indeed reduce the amount of energy carried along the ossicles to the cochlea. The eustachian tube connects the middle ear with the nasopharynx (the area behind the nasal passages and above the oral cavity) and serves to equalize the middle ear pressure (see Figure 4). When individuals suffer from eustachian tube dysfunction (where the eustachian tube fails to open and close normally), there is development of excess negative pressure in the middle ear space. This leads to retraction of the tympanic membrane and decreased efficiency of the conductive mechanism that transmits sound from the eardrum to the cochlea (via the ossicles). The negative pressure also can lead to fluid accumulation in the middle ear space, which further impedes the conduction of sound energy. Children suffer from eustachian tube dysfunction more frequently than adults. Consequently, many children must undergo myringotomy (incision in the tympanic membrane) and placement of pressure equalization tubes (i.e., ear tubes) to relieve the negative middle ear pressure and allow drainage of fluid that may have collected in the middle ear space. The internal ear is composed of the cochlea and the vestibular system. The vestibular system is composed of the semicircular canals, utricle, and saccule. The cochlea is shaped like a snail, having approximately 2¾ turns, and is surrounded by the hardest bone in the human body. 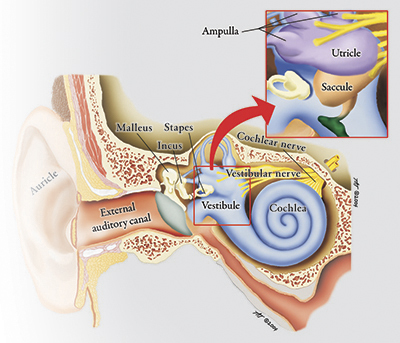 The cochlea is composed of three fluid-filled cavities that wind around the central portion of the cochlea, known as the modiolus (See Figure 5). LifeArt image copyright 2007 Lippincott Williams & Wilkins. All rights reserved. These three fluid-filled cavities are known as scalae (from the Latin meaning “a stairway”)—the scala vestibuli, the scala media, and the scala tympani. 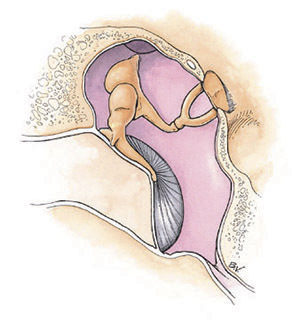 The scala vestibuli and scala tympani are connected via a duct at the apex of the cochlea (the helicotremma). The scala media is suspended between the scala vestibuli and scala tympani. There are two different fluids that fill the scalae of the cochlea: perilymph and endolymph. The perilymph is contained within the two continuous scalae (i.e., the scala vestibuli and scala tympani). Perilymph is very similar in composition to extracellular fluid in the human body (high sodium concentration and low potassium concentration). Endolymph is contained within the scala media and is similar in composition to intracellular fluid (high potassium content and low sodium content) (Pasha, 2006, p. 302). If you could enter the scala vestibuli at the base of the cochlea (through a structure known as the oval window) and “swim” upward through the perilymph in a curving fashion to the apex of the cochlea, you would cross over to the scala tympani at the helicotremma and follow the curve of the cochlea downhill through perilymph, exiting through a structure known as the round window (which is covered by a thin membrane). With this understanding of cochlear anatomy, perhaps it will be easier to appreciate the path of the fluid wave that passes through the cochlea when a sound wave contacts the TM and is conducted to the oval window via the ossicles. The stapes footplate (the oval-shaped bony portion of the stapes) rests in the oval window. The movement of the ossicles and piston-like action of the stapes creates a fluid wave in the scala vestibuli. The fluid wave then travels through the scala media (which contains endolymph and is suspended between the scala vestibuli and scala tympani) and then to the scala tympani. Further discussion of cochlear anatomy is necessary to understand what happens next. The scala media is bounded by Reissner’s membrane (upper border) and the basilar membrane (lower border). The organ of Corti (the sensory end organ for hearing) rests on the basilar membrane. The organ of Corti has special “hair cells” that rise to terminate in (or near) the tectorial membrane. There are approximately 30,000 hair cells in the cochlea (Whitehead, 2006). As the fluid wave causes vibration of the scala media, the motion of the hair cells leads to stimulation of nerve cells at the base of each hair cell. There are approximately 30,000 neurons (nerve cells) that connect these hair cells to the brain (Calhoun, 2001, p. 1631). This neural signal is communicated along the cochlear division of the vestibulocochlear nerve to the brain, where further processing takes place. As the stapes moves inward and outward in the oval window (like a piston), a wave is created in the fluids of the inner ear (the perilymph and endolymph). This wave travels from the base of the cochlea to the apex. The wave ultimately leads to hair cell motion in the organ of Corti. The mechanical properties of the basilar membrane determine the distance that the wave travels toward the apex of the cochlea. The traveling wave activity for high-frequency sounds is more pronounced at the base of the cochlea, whereas wave activity at the apex of the cochlea is more pronounced with low-frequency sounds. Thus, the cochlea is said to be tonontopically organized, i.e., because high frequency sounds correspond with the mechanical movement of the basilar membrane at the base of the cochlea and low frequency sounds are associated with movement of the basilar membrane at the apex of the cochlea (Templer, et al., 1987, p. 14). The cochlea also performs place analysis because of the spatial representation of frequency information (p. 14). Additionally, the traveling wave results in frequency information which is encoded by the rate of neuron (nerve cell) firing. Individual nerve cells may fire at rates up to (and beyond) 1000 times per second (p. 14). It is interesting to note that when single fibers of the cochlear nerve are studied, each neuron is specifically tuned to be activated with a low threshold at a characteristic frequency. Once again, the characteristic frequency of a nerve fiber is determined by the place of attachment to the cochlea, i.e, the low frequency fibers terminate in the apex of the cochlea while the high frequency fibers terminate in the base of the cochlea (p. 15). As one author has observed: “[T]he ear has the capability to encode acoustic signals on an array of neurons that carry frequency specific information. The resolving power of the cochlea enables extraordinary discrimination among complex signals” (p. 15, emp. added). Note how the ear converts sound wave energy into mechanical energy as sound travels through the EAC, contacts the TM, and sets the ossicles in motion. Mechanical energy is then converted into hydraulic energy when the stapes creates a fluid wave in the cochlea. Finally, the hydraulic energy is converted into electrical (neural) energy with movement of the hair cells in the cochlea. Ultimately, this neural energy is transmitted along the vestibulocochlear nerve and interpreted by the brain as sound. Such sophistication and complexity simply could not have evolved. As noted earlier, the vestibular system is also contained within the internal ear. The vestibular system includes the semicircular canals, which detect rotational acceleration and play a large role in maintaining balance (Pasha, 2006, p. 302). Also within the vestibular system are the utricle and saccule (see Figure 6), which detect linear acceleration and changes in gravity, and therefore also play a significant role in maintaining balance (p. 303). Disruptions in the function of the vestibular system can lead to debilitating symptoms of vertigo, imbalance, nausea, and vomiting. 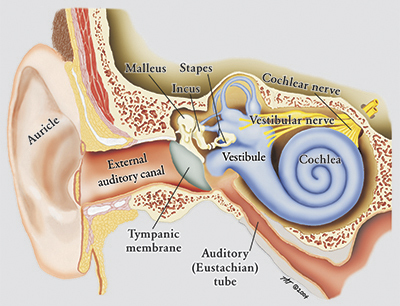 The information collected in the cochlea and vestibule is then transmitted to the brain in the form of electrical signals (via the eighth cranial nerve, also known as the vestibulocochlear nerve). This nerve passes through the internal auditory canal, and the cochlear division of the nerve proceeds to an area in the brain known as the cochlear nucleus. The vestibular portion of the nerve travels to the vestibular nuclei. [t]he human ear is a rather wondrous instrument. It is composed of tens of thousands of component parts, can work quite flawlessly from well before we are born to more than a century of age, and is capable of performing extremely sophisticated auditory tasks. And, it works 24 hours a day! (Whitehead, 2006). This brief examination of the marvelous mechanism of hearing should lead to a greater appreciation for our Creator as well as His creation, and serve as a reminder that our spiritual “ears” must be attuned to hearing the Lord’s teaching and instruction (Matthew 11:15; 13:9,43). Of course, those who are physically deaf can still “hear” the Lord by reading and understanding the inspired Scriptures. In Proverbs 18:15, the author writes: “The heart of the prudent acquires knowledge, and the ear of the wise seeks knowledge.” Jesus made it clear that if we suffer from spiritual hearing loss, we will be unable to enjoy the blessings that are found in Him: “For the hearts of this people have grown dull. Their ears are hard of hearing, and their eyes they have closed...lest they should understand with their hearts and turn, so that I should heal them” (Matthew 13:15, emp. added). Jesus went on to say: “But blessed are your eyes for they see, and your ears for they hear; for assuredly, I say to you that many prophets and righteous men desired to see what you see, and did not see it, and to hear what you hear, and did not hear it” (Matthew 13:16-17). The apostle Paul also discussed the topic of hearing. He warned Timothy of individuals who desire to hear false doctrine rather than the sound teaching of our Lord and Savior: “For the time will come when they will not endure sound doctrine, but according to their own desires, because they have itching ears, they will heap up for themselves teachers; and they will turn their ears away from the truth, and be turned aside to fables” (2 Timothy 4:3-4). We must attune our ears to listen intently to God’s Word alone and not be turned aside to the teachings or creeds of man. In doing so, we have the reassurance that we can overcome and partake of the tree of life: “He who has an ear, let him hear what the Spirit says to the churches. To him who overcomes, I will give to eat from the tree of life, which is in the midst of the Paradise of God” (Revelation 2:7). Certainly, the wonderful structure, function, and complexity of the human ear is evidence of the Mighty Creator, the Designer not only of the ear, but the heavens and the Earth as well (“God, who made the world and everything in it...,” Acts 17:24). David certainly appreciated God’s design of the human body when he declared: “I will praise You, for I am fearfully and wonderfully made” (Psalm 139:14). Indeed, “[i]f we had no other piece of evidence in the Universe to study, the human ear would be sufficient proof of the existence of the Creator” (Miller, 2006, 12:91). While it is interesting to learn of the intricate detail and divine design used in creating the human ear, infinitely more wonderful is the knowledge (through the Scriptures) that the Creator’s ear is open to the petitions of His children: “For the eyes of the Lord are on the righteous, and His ears are open to their prayers; but the face of the Lord is against those who do evil” (1 Peter 3:12). May we stand in awe of the matchless Creator, the Redeemer of mankind, and listen to His inspired Word, knowing that His ears are open to our prayers if we walk according to His will. Bailey, Byron, et al. (2001), Head & Neck Surgery—Otolaryngology (Philadelphia, PA: Lippincott Williams & Wilkins). Lee, K.J. (2003), Essential Otolaryngology, Head & Neck Surgery (New York: McGraw-Hill). Miller, Dave (2006), “Listen For Design,” Discovery, 12:91, December. Pasha, Raza (2006), Otolaryngology, Head and Neck Surgery, Clinical Reference Guide (San Diego, CA: Plural Publishing). Templer, Jerry, et al. (1987), Otolaryngology, Head & Neck Surgery: Principles & Concepts (St. Louis, MO: Ishiyaku EuroAmerica). Whitehead, Gordon (2006), “A Brief Journey Through the Ear,” [On-line], URL: http://www.digital-recordings.com/audiocd/journey.html#eighth. Copyright © 2007 Apologetics Press, Inc. All rights reserved.